Dominican Republic is the newest jewel in the Lifestyle Holidays Vacation Club crown. Nestled along the Cofresi beach shores, and overlooking the sparkling Caribbean sea, this resort caters to the luxurious enjoyment of both families and couples looking for that perfect getaway. With 468 well-appointed accommodations, family friendly rooms with either a king size or two queen size beds, located in a quite setting between the ocean beach and spectacular pool, this is a paradise worthy of the Lifestyle name. The resort was created with space and comfort in mind, making Cofresi Palm a relaxing, enjoyable and satisfying experience for all guests and their families. All rooms have air conditioning, cable television, phones, and ceiling fans, while the decor has a distinctive design, featuring dark wood furnishings. Shaded patios and verandas provide a relaxing place to gather in some of the units. 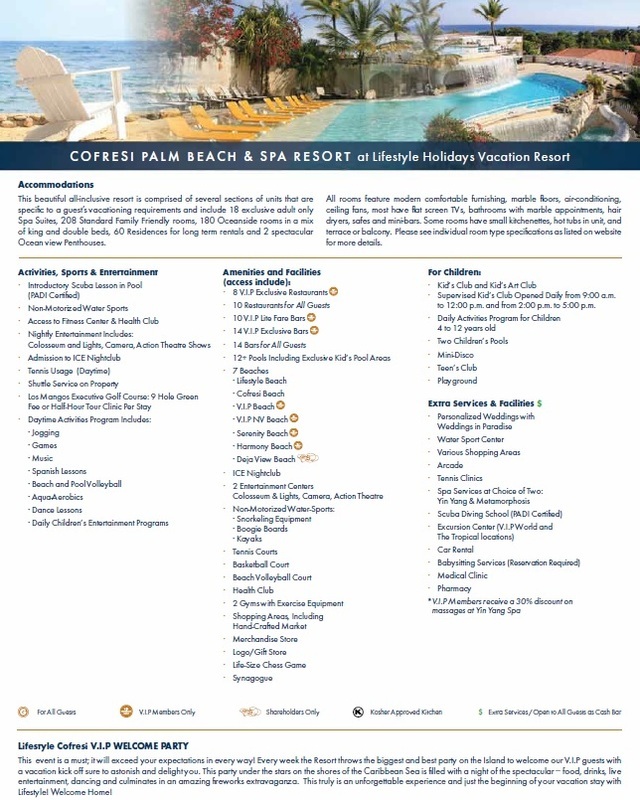 Providing both service and features that are standard for a Lifestyle property, the Cofresi Palm offers a unique luxury accommodations experience. 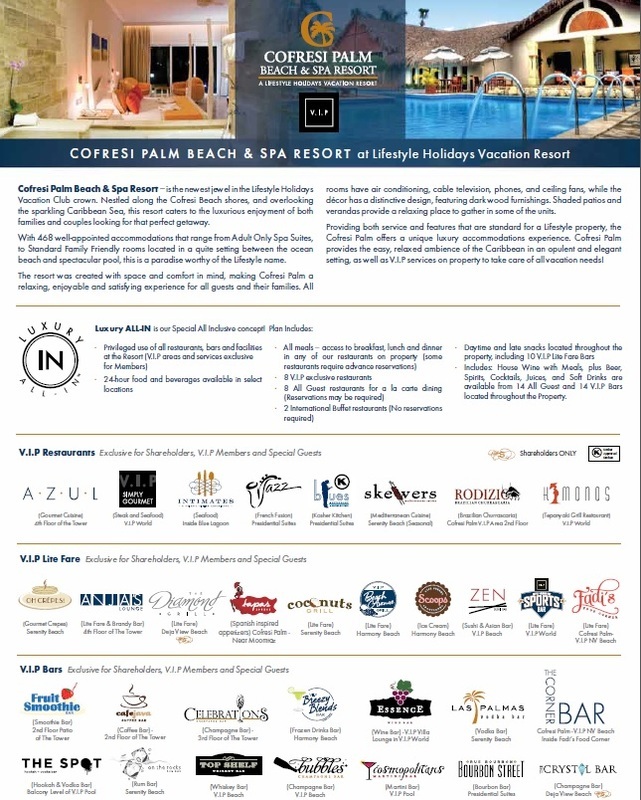 Cofresi Palm provides the easy, relaxed ambiance of the Caribbean in an opulent and elegant setting, as well as V.I.P services on property to take care of all vacation needs! 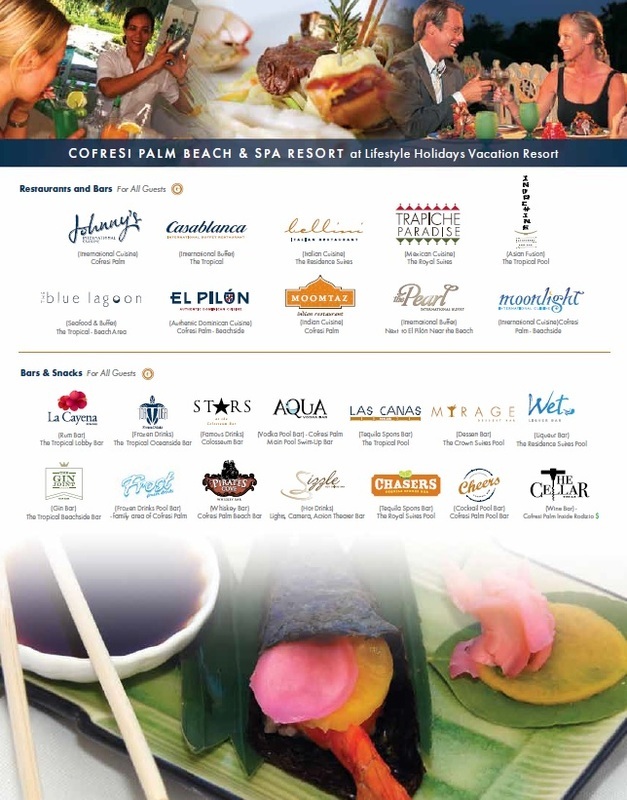 Experience the array of beauty and excitement that Cofresi Palm Beach & Spa Resort has to offer. Our clients will receive one bottle per person of international brand liquor delivered to the accommodation on top of the all-inclusive. This includes the resort fee of $5.00 per day per person for non members.